If you want to experience one holiday in the High Pyrenees, then this is it! The spectacular glacial "amphitheatre" of Gavarnie (a UNESCO World Heritage site); the amazing Ordesa Canyon; lovely hotels - one made famous by Victor Hugo and Chateaubriand. Rewarding but comfortable walking. This itinerary makes sure you experience the very best of the High Pyrenees, not least by staying in high quality hotels right in the heart of these magical mountains, both in France and Spain - this is truly a holiday without frontiers. We also include private transfers that ensure you only walk the best "bits", and there are always alternative itineraries for those who want more - or less - walking on any particular day. The private transfers enabling you to only walk the "best bits" inevitably add to the holiday cost, so it cannot be directly compared with apparently similar holidays. We meet you at Lourdes (airport, train station or a hotel of your choice) and take you to Gèdre. Pick-ups from Toulouse, Pau or Biarritz are also available (please consult us for prices). 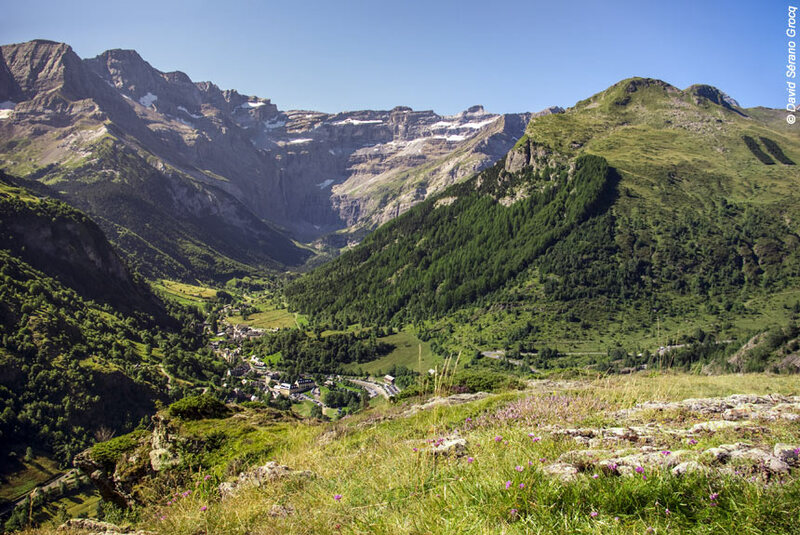 Gèdre is a typical and traditional Pyrenean village, wonderfully located where the Troumouse and Gavarnie valleys meet. En route and all around you in the village you will see the magnificent environment you will be exploring in the coming days. You stay two nights at the recently refurbished, very comfortable and renowned three star Hôtel de la Brèche de Roland with its impressive and enjoyable restaurant serving local traditional dishes transformed into contemporary masterpieces by chef-owner Philippe Pujo. The Brèche de Roland - Roland's Breach - is a 40 metre wide, 100 metre high gap in the cliffs dividing the two sides of the High Pyrenees, and legend claims it was cut by Count Roland using his sword Durendal after losing the 8th Century Battle of Roncesvalles. The hotel is pretty much the only place in the valley where the Breach is visible without having to climb up a mountain. We transfer you to the fascinating Heas Chapel - a 16th century pilgrimage chapel built to house a wooden Black Madonna found by local shepherds, and which miraculously (say some) survived an avalanche. 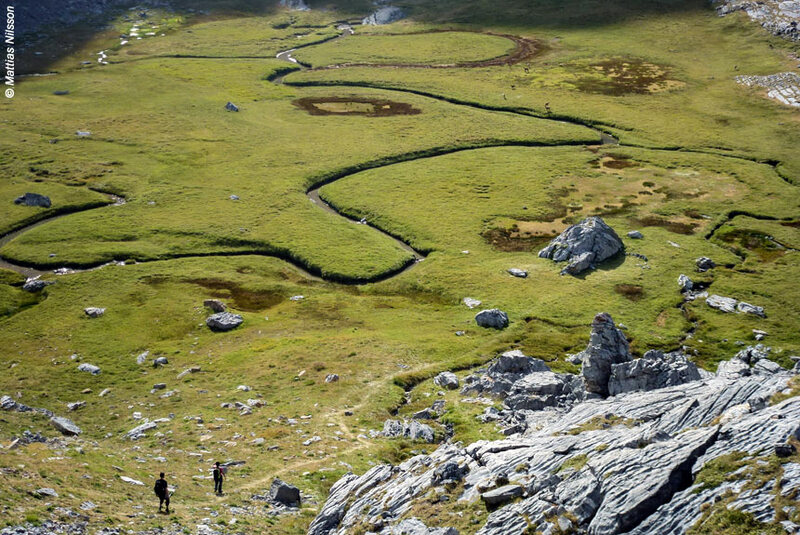 You then climb progressively up the side of a hidden valley to the dramatically located Cabane des Aires, a mountain refuge, and from this high altitude plateau you can see the whole of the phenomenal natural arena of the Cirque de Troumouse rising to over 9,000 feet. On the peaks, there is often snow even in July. After walking around the Lac des Aires, you descend to the Maillet mountain auberge for a well earned drink before heading back down to Héas. A more challenging option is to visit the Lac des Gloriettes, whose turquoise waters usually reflect the celebrated Mont Perdu (over 10,000 feet), and the Estaubé valley. You stay again tonight at the Hôtel de la Brèche de Roland. Walking time : 4h30. Distance : 10km. Elevation : + 700m / - 700m. Transfer time : 15 minutes. Today begins with a walk through a wood before you climb consistently up to the high pastures of the Granges (barns) de Saugué, used only in summer. 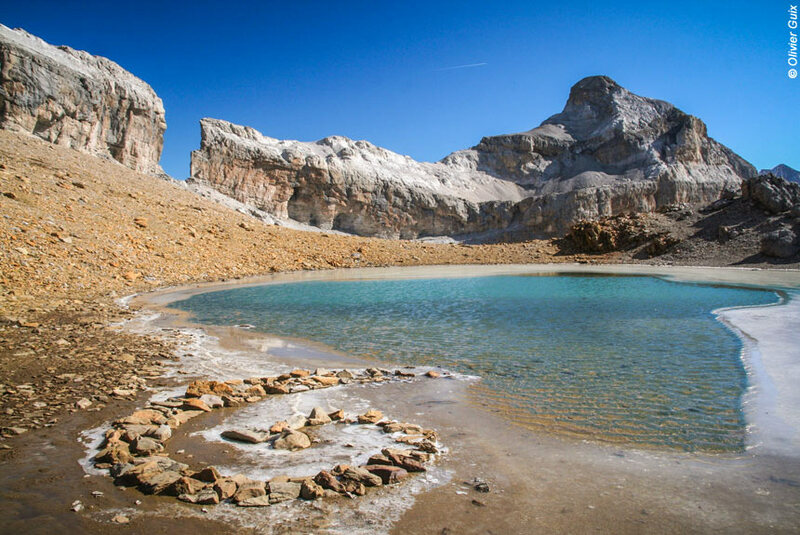 You will already have seen magnificent views of the Cirque de Gavarnie, but now you walk through alpine meadows rich with flowers in season to gain a panoramic perspective on the majestic glacial "amphitheatre" with its dozens of waterfalls. The only thing that is not a wonder is that it is a UNESCO World Heritage Site. You then have an unforgettable descent down a natural balcony protected by stone walls until you arrive back at Gavarnie village. You stay two nights at the grand three star hotel Hôtel le Vignemale in Gavarnie, with its unique and privileged view of the Cirque de Gavarnie - facing south to the highest waterfall (well over 1,000 feet) to Mount Perdu (The Lost Mountain). No wonder it has hosted many famous people, including Victor Hugo (Les Miserables and The Hunchback Of Notre Dame) and the great Romantic writer and soldier in America who gave his name to that steak, Chateaubriand, and today it is a beautifully refurbished hotel with wood lined rooms. Walking time : 5h. Distance : 16km. Elevation : + 850m / - 500m. Today we visit what most people regard as the most exceptional and memorable site in the whole of the Pyrenees. You walk fairly gently up a wide path on a mountain "balcony" to the Bellevue plateau with privileged panoramas of the high mountain scenery all around you. From the top, you descend into the centre of the enormous natural "amphitheatre" that is the Cirque du Gavarnie with its myriad waterfalls - many impressively long and powerful - sheer bare rock cliffs, and contrasting peaceful valley bottom. The appropriately named Grande Cascade at about 1,300 feet is over 300 feet higher than the Eiffel Tower (300 feet! ), and one of the highest in Europe. The bucolic final section is along the valley bottom, or, more challengingly, by the Espugues route, which follows an attractive rocky valley. Either way you arrive at Gerdre-Gavarnie village. Truly memorable, we are confident you will agree. 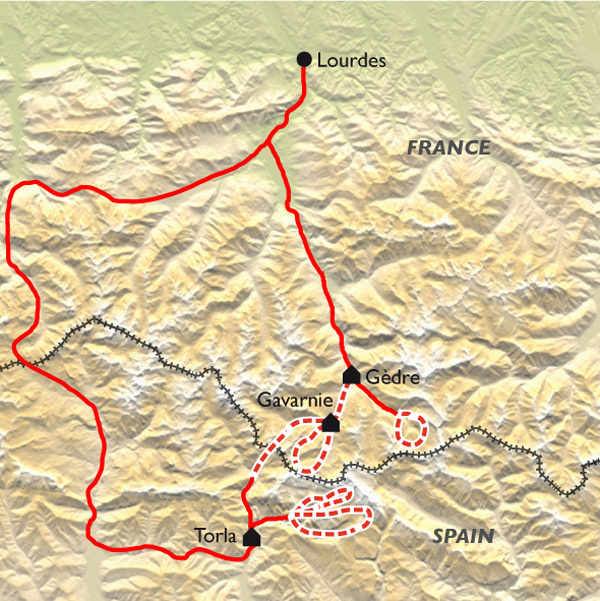 You stay again at the Hôtel le Vignemale from where you can now see where you have walked that day - and perhaps you can pat yourself on the back for your achievements! Walking time : 5h or 6h. Distance : 9,5km. Elevation : + 500m or 750m / - 500m or 750m. Today you wake in France and sleep in Spain. It is a fairly challenging walk - but hugely enjoyable and rewarding (and, anyway, the previous days will have got you walking fit). The highlights include: the walk up to the appropriately named Plateau de Bellevue; the walk under the Brèche de Roland, its cliffs towering above you; your views of the French and Spanish Pyrenees from the top of the Pouey-Aspé valley; the looping path to the frontier col at Port de Boucharo nearly 7,000 feet up and resonant with history; the descent into Spain; and finally the arrival at Torla, one of our favourite places, after a short transfer to save you those last excessive miles. You stay three nights at the welcoming Hôtel Bujaruelo beautifully situated right in the centre of this charming mountain village with its cobbled streets, and facing the Ordesa Canyon itself. The hotel is traditional in style with wooden floors, some wooden ceilings and balconies presenting the most inspiring views, not least of Mount Perdido (as it is called here). You will also enjoy the subtle (and sometimes not-so-subtle) changes from French to Spanish cuisine. Walking time : 6h. Distance : 12,5km. Elevation : + 900m / - 900m. Transfer time : 30 minutes. 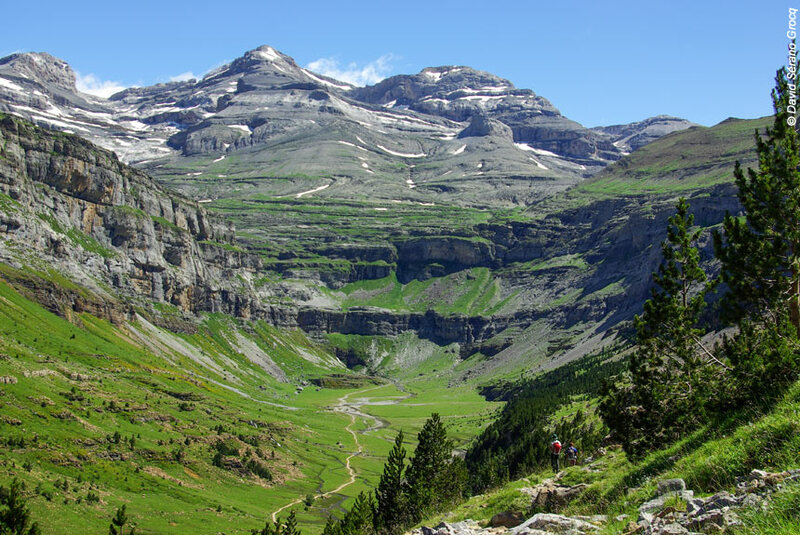 This is a long, but hugely rewarding day's walking, which you start by taking the shuttle bus the short distance to Ordesa where you will enter the spectacular Canyon itself, and where the cliffs rise 3,000 feet above you while forest alternates with meadows around you. 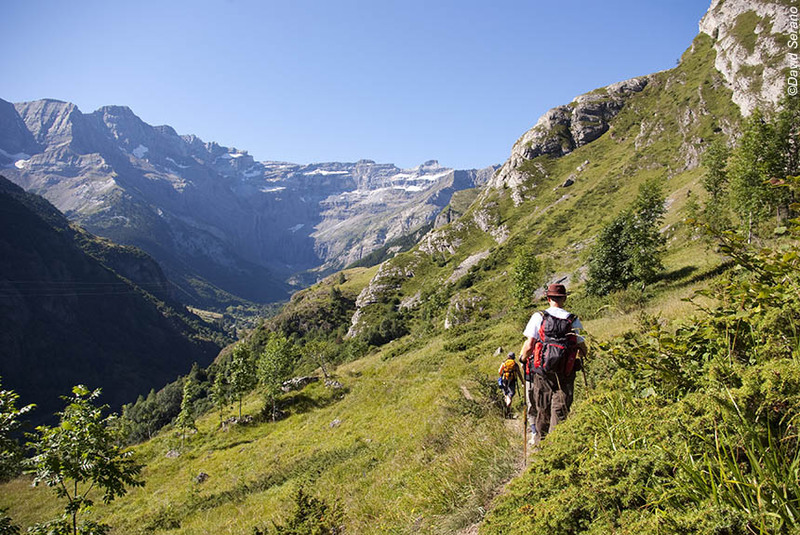 You zig-zag through forest up the stunning Chemin des Chasseurs (Hunter's Trail) until you join the wonderful panoramic footpath the follows the Ordesa valley, the Faja Pelay, where you can see Mount Perdido and enjoy the alpine type meadows all around you. Particularly near the magnificent (and magnificently named) Cascade de la Cola del Caballo you will find edelweiss everywhere. Reluctantly we are sure, you will descend to the bottom of the valley, but not without enjoying the succession of comparatively small waterfalls that is the Gradas de Soaso. You stay a second night at the Hôtel Bujaruelo surrounded by the paths you have walked and mountain scenery you have almost obsessively photographed (we all do it!). Walking time : 6h30. Distance : 18km. Elevation : + 600m / - 600m. Transfer time : 15 minutes. Today you will be exploring the other side of the Canyon - the side with the high cliffs - but worry not! It is all well planned and safe as houses. You again take the shuttle to the Canyon, and take a pretty path through bushes and trees to the heart of the almost overwhelming Cirque de Cotatuero with its beautiful waterfall. Mountaineers may continue straight up to the Breche de Roland, but we prefer the less travelled balcony paths known as "fajas". You will experience the amazing Canarellos balcony path, but the fitter of you may like to tackle the Racun balcony path. In late spring and early summer, you may also experience the unforgettable pleasure of walking through flowering and fragrant broom and other mountain plants. At the end of this path, you arrive at the Cirque de Carriata, which presents a surprising vista of immense limestone cliffs - again, not a little overwhelming, even when you have experienced so many wonderful sights over the last few days. You may enjoy your last night at the Hôtel Bujaruelo, and the end of your holiday, by pushing the boat out with cocktails and/or champagne. It will be well earned, and a fitting end to what we are confident you will say has been one of the most memorable holidays of your life. Walking time : 4h or 6h. Distance : 12 or 15km. Elevation : + 500 or 750m / - 500 or 750m. Transfer time : 15 minutes. We transfer you back to Lourdes after breakfast (airport or railway station). You can, however, extend your stay by spending a night or two in Lourdes (see below). Transfers also available to Toulouse, Pau or Biarritz (please consult us for prices). Transfer time : 3 hours. You can choose to stay an extra night at the three star Hôtel Beauséjour in Lourdes to visit the religious sites, and take the funicular up to the Pic du Jer, which has exceptional panoramic views. This holiday features somewhat challenging walking on some days, so is most suitable for those who are reasonably fit, and/or do quite a lot of walking. It can get quite hot in July and August, as well as more crowded, and we would recommend June and from late August to the end of September as the best periods. We will transfer your luggage between each hotel, so all you need to carry when walking is a daysack with all you regard as essential. You stay in double or twin rooms for 4 nights in three star hotels, and 3 nights in a particularly good two star hotel. You will eat very well. Dinners are based on set menus featuring regional specialities usually with 3 or 4 choices for each of three courses, but you can pay locally for upgraded choices. Breakfast is included every morning, but lunches and picnics are not because there are plenty of places to make your own choices, although the night before you can ask the hotel for a picnic, which you can pay for locally. 7 nights dinner, bed and breakfast; people transfers from and to Lourdes; luggage transfers; detailed walking instructions; 1:25,000 IGN map; 24/7 customer phone service. The journey to the start point, and from the finish point, except as specified; lunches; drinks with meals; non-standard menu items; shuttle bus charges (about £4 per person per journey); personal and travel insurance.